I loved Robin Coyle’s post a couple of weeks ago about Cozy Bookstores. It made me reminisce for the future (is that possible? ), when e-books become ubiquitous and bookstores disappear. 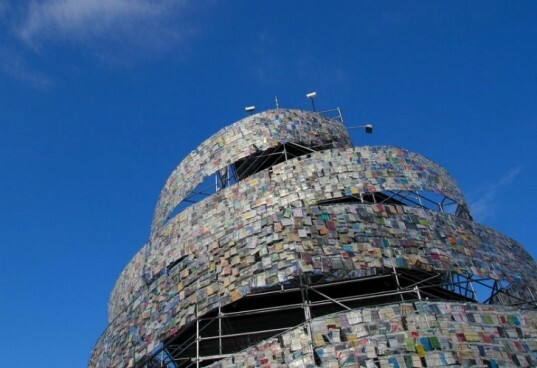 Maybe we’ll see pop-up libraries, like the ones highlighted in this article from Inhabitat. The “buildings” are unconventional, like an old phone booth or a bus. And they’re places where book browsers can take a book as long as leave another one behind. The fact that people are interested in developing pop-up libraries in the first place gives me hope that e-books won’t obliterate libraries. Thanks for the mention Tracy! Love the phone booth pop-up library. Funny. Pay phones are a thing of the past but the booths are now home to another dying breed (well, I hope not dead). I love bookstores and I frequently go to the used one by my house. It would be sad to see them go away, but maybe it is the future.